The name Kenya likely comes from the Kikuyu tribe who lived at the foot of the mountain called Kirinyaga, which means, “Place of Brightness.” It is believed that the British who colonized the area in the mid-19th century, mispronounced the name and called the mountain “Mount Kenya” and the entire territory “Kenya” as well. Although Kenya is located on the equator, Mount Kenya has permanent glaciers on it and is the second highest peak in all of Africa. Kenya is located in East Africa with 333 miles of coastline on the Indian Ocean to the east. Her neighbors are Somalia, Ethiopia, Sudan, Uganda and Tanzania. Sometimes referred to as “The Cradle of Humanity”, the country is part of the Great Rift Valley. Paleontologists have discovered some of the earliest evidence of man’s ancestors, dating back to 3.3 million BC. The Portuguese arrived in 1498 and the port of Mombasa became an important resupply stop on route to the Middle East. The Portuguese gave way to Islamic control under the Imam of Oman, in the 1600s. That lasted until another European influence came along, the British, who founded the East African Protectorate (now known as Kenya) in 1895. It became a British colony in 1920. During this period, thousands of Indians were brought into Kenya to work on building the Kenya/Uganda railway line and subsequently settled there. After numerous uprisings, thousands of Kenyans were incarcerated in detention camps. Kenya finally became independent on December 12, 1963. Today, Kenya is multifaceted with over 40 different ethnic groups. The largest group is the Kikuyu, who migrated to the region at the beginning of the 18th century. Each ethnic group has their own indigenous language and culture. About 13 percent of the population is of non-African descent. The official languages of Kenya are Swahili and English. They bridge the communication gap and unite Kenya as a single nation. The constitution of Kenya guarantees freedom of religion and worship to its people. The vast majority of Kenyans are Christians. Islam is another major religion. Followers include both Sunni and Shi’ite Muslims and are mostly found in Mombasa and the neighboring coastal regions. The small, Indian population mostly adheres to Hinduism and Sikhism. Their indigenous beliefs of traditional African religions are combined with various aspects of Christianity. Almost all ethnic tribes have their own variety of music and dance. Traditional African beats are usually backed by drums and guitar like instruments. Contemporary music, including lingala and benga rhythms, as well as taarab music, were inspired by Arab and Indian immigrants. Another fascinating aspect of Kenyan culture is the art and artifacts crafted manually by the different tribes. Beautifully carved wood sculptures are produced locally and sold throughout the world, as well as hand-woven baskets made of sisal, Maasai beaded jewelry, musical instruments, tribal masks, paintings, prints, batik cloth, colorful kangas (African cloth) and the beautiful Kikoys (African sarongs). Kenya is one of Africa’s most developed economies. It has gradually emerged from political instability and government corruption, although it still struggles. Terrorism has been a big problem in recent years. In 1998 Al-Qaida operatives bombed the US embassy in the capital city of Nairobi, killing 224 and injuring thousands. In 2011, Somali militants raided Kenyan coastal resorts, targeting the foreigners staying there. Most recently, in April of 2015, Al-Shabab militants massacred 148 students at Garissa College, horrifying Kenya and the rest of the world. This was just two years after 67 were killed and 175 wounded when gunmen attacked the most upscale mall in Nairobi. Yet even after these tragedies, Kenya remains a very popular tourist destination. By far the main tourist attractions are the safaris through the 19 national parks and game reserves. Safari used to mean a hunt but thankfully today, the rifles have been mostly replaced with cameras. It is one of the few places you can still find the “Big 5” deadliest mammals: the lion, Cape buffalo, leopard, rhino and elephant (which sadly have both been heavily poached there, even in the national parks.) Animals are literally everywhere, with herds of zebras, giraffes, hippos, dozens of species of antelopes, monkeys, wildebeest, (where 1.4 million migrate each year from Tanzania to Kenya and back again), hyenas, cheetahs, wart hogs and so many more. The show is up close and personal as you see lions, devouring their kill, elephants charging and leopards dragging their prey up a tree. It is raw nature at its finest. Bird watching is another huge tourist attraction, with over 1000 species found there including seas of pink flamingos, egrets, guinea hens, giant raptor kites and vultures that clean up on a kill once the lions are satisfied. Then there is a whole other arena with beautiful coral reefs in the Indian Ocean, offering some of the best diving opportunities in the world. Another attraction is the Maasai Mara National Reserve where the Maasai villages can be found. The Masai people live in southern Kenya, along the Great Rift Valley. They are a semi-nomadic tribe whose subsistence economy relies on cattle, goats and sheep. A Maasai prayer “Meishoo iyiook enkai inkishu o-nkera” translated to English means “May the creator give us cattle and children.” Cattle and children are the most important treasures of the Maasai people. The Maasai live in villages, called Kraals, which are arranged in a circular fashion. Every person in the Maasai community has a role to play. The fence is made of acacia thorns to prevent lions from attacking their cattle. The houses, or Bomba, are built by the women and made of timber poles and then plastered with a mix of mud, sticks, grass, cow dung and urine. Nearly all the needs for food are met by the cattle they raise. They eat the meat (although they prefer to amass large herds), so they also have a tradition that collects blood from a nicked jugular on the cow’s neck, which they then mix with the cow’s milk and drink. This allows the cow to stay alive and provides a rich protein source in their diet. Recently with drought and climate change causing their herds to diminish, the Maasai have grown dependent on other foods such as sorghum, rice, potatoes and cabbage. Bright red is the traditional color of the Maasai and the shield on the Kenyan flag is in fact, the shield of the Maasai warriors. The Maasai welcome guests into their community to see their most interesting culture and traditions. As we look into the cuisine of Kenya, maize, potatoes and beans are the staple crops. Ugali is a porridge made of maize, similar to fufu made of cassava. It is served at almost every meal along with stews. Meat, mostly goat, beef, mutton and chicken are eaten. Fish from the Indian Ocean and from Lake Victoria are enjoyed by those who live nearby. In the capital city of Nairobi, International faire is found. The Indians who were brought over to help build the railroad have had a very strong impact on the cuisine. Chapati is an Indian flat bread that is ubiquitous there. 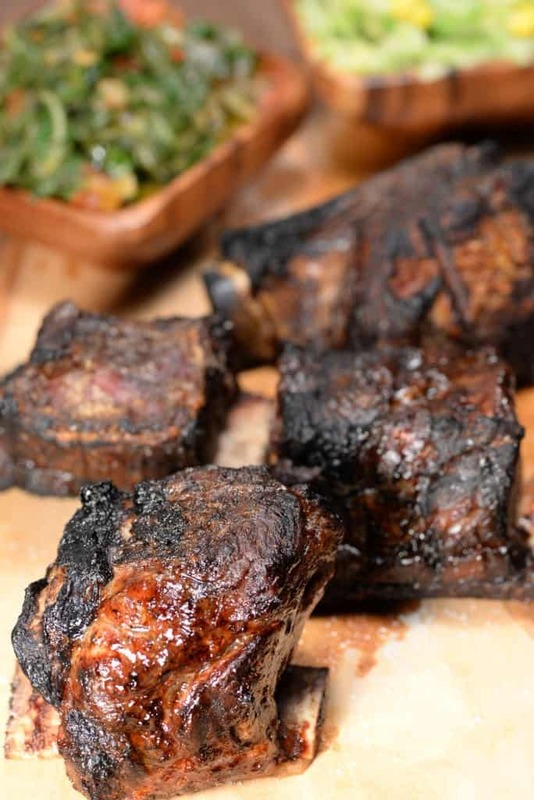 Nyama Choma is grilled meat and considered the national dish (served with Ugali.) Kenyans are big exporters of coffee and tea (chai) and Kenyans themselves consume a lot of tea, which is served with milk and sugar. Afternoon tea time is coveted there and is clearly an influence from the British. Kenya has had challenges with poverty and hunger. Drought at times, has been severe. 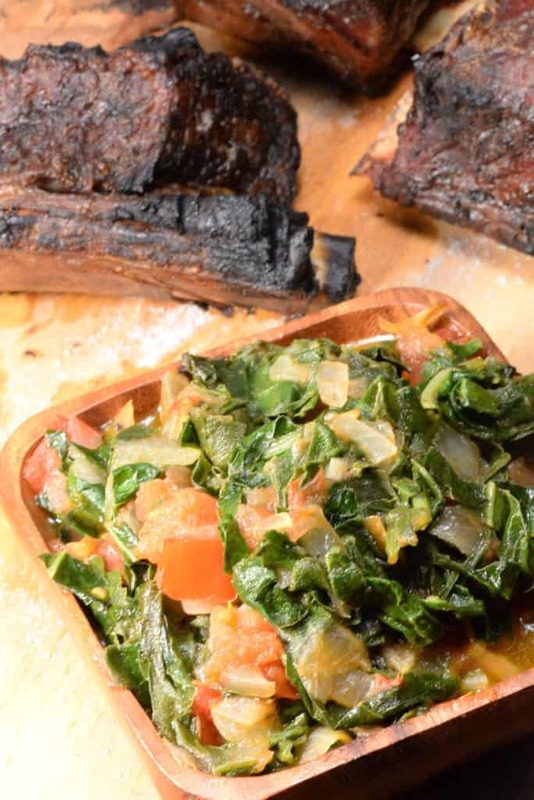 They even have a dish called Sukuma wiki that literally translated means, “stretch the week.” Any leftover meat can be combined with greens to make another meal. 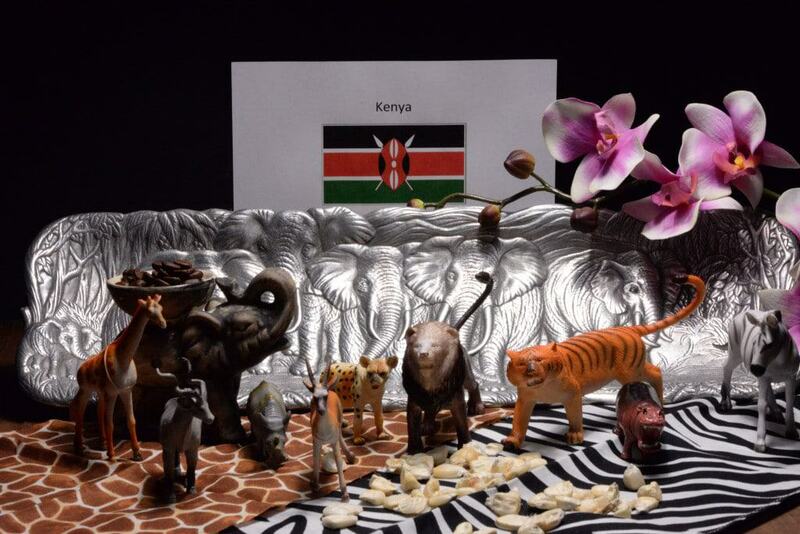 We decorated the table with animal print and animals that would be found on a safari. Corn and coffee were arranged as they are important agricultural items to the Kenyans. We also decorated with orchids, the national flower of Kenya. We put benga music on the stereo, with its infectious guitar and drum beats to set the Kenyan mood. We began our meal by saying “Chakula Chema” which means, “Bon appetite” in Swahili. 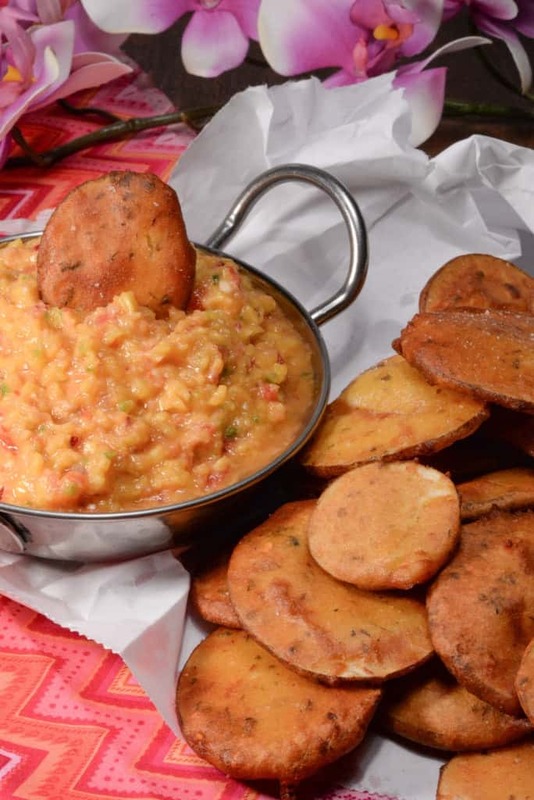 Our first course was a street food called bajias, which clearly shows the Indian influence. 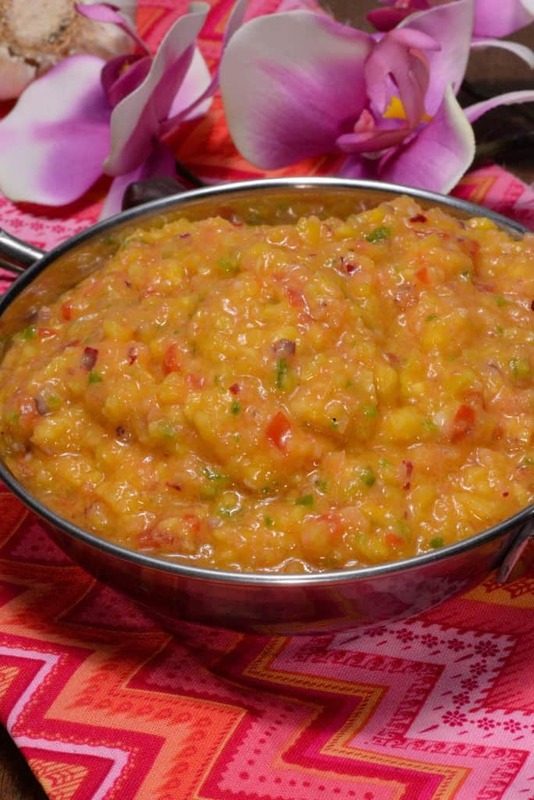 Heavily seasoned and battered potatoes are fried and then dipped in a delicious mango chutney, called madras. The chutney has a nice kick to it, due to the hot peppers, a real delight to enjoy with a good Kenyan beer. “Maisha marefu” means “Cheers” and Kenyans are the largest consumers of beer in all of Africa. Next, was the main course, Nyama Choma, which in Swahili means, roast meat. It is always eaten with your hands and goat meat is most often used, but beef ribs are also very popular. The preparation is simple; just a mist of salt water while cooking slowly over the flame. The result is awesome. Sometimes I find, it is the simple things in cooking that are the best and Nyama Choma is a perfect example. This dish represents the fun loving spirit of the Kenyan people. Whenever there is Nyama Choma, people gather for delicious food, music and a good, festive time. The meat was served on a cutting board, which is customary there. Alongside it we had another very popular dish, called Irio (pronounced eer-e-o.) 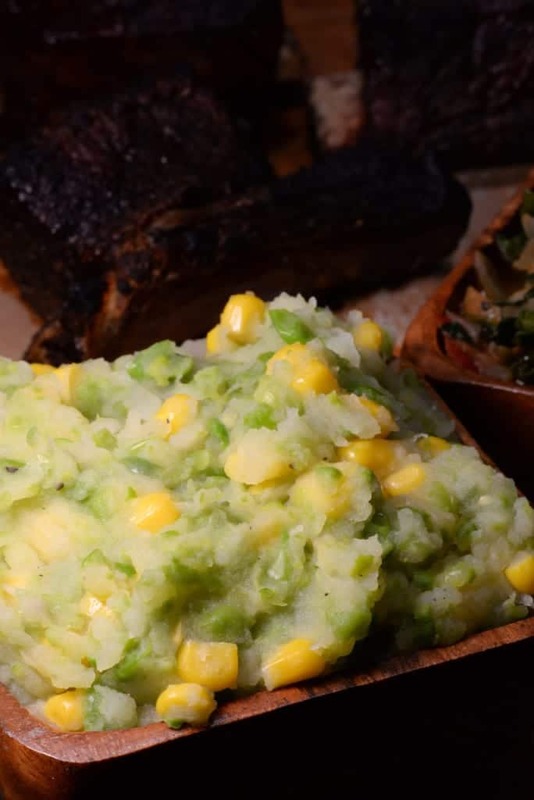 This dish is basically mashed potatoes with peas and corn added. The result is a lovely side dish for nearly any occasion. We also enjoyed the greens dish, called Sukuma wiki. 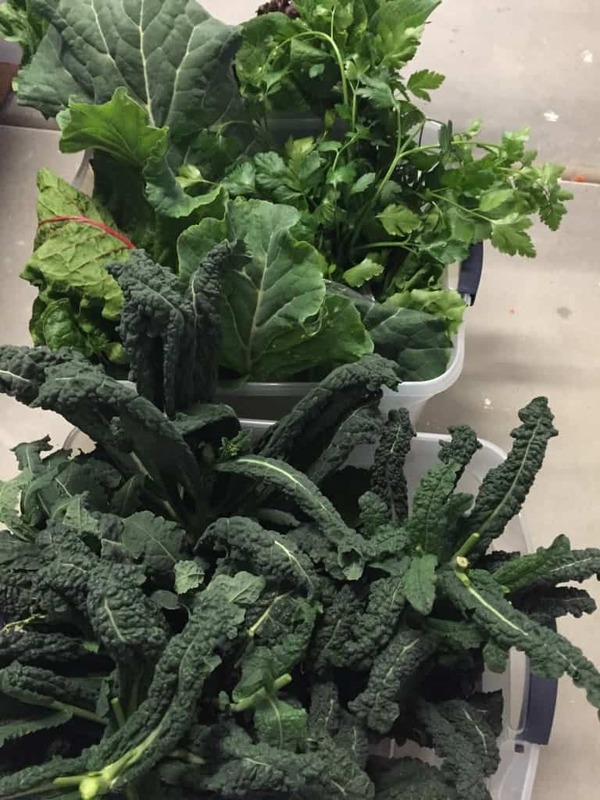 We didn’t add the meat to ours, but we did use left overs for lunch the next day to “stretch the week.” The dish is made of greens, kale or collard greens, both of which I happen to have in abundance in our International Cuisine garden. Onions are sautéed with tomatoes and then the greens are added. This is another keeper of a side dish; simple to make, healthful and yummy! An abundance from our organic International Cuisine garden on its way to feed the homeless at our local Rescue Mission. For dessert, fruit is often served as an end to a Kenyan meal. 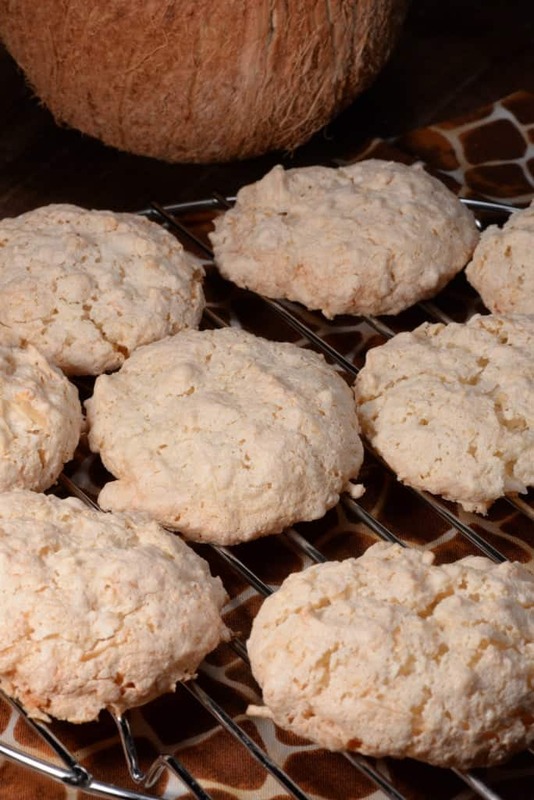 However, we instead had coconut macaroons; a sweet treat to finish our Kenyan feast and savor with our chai. We concluded our evening by watching the movie “Out of Africa,” starring Meryl Streep and Robert Redford (a couple of our favorite actors). The movie was filmed in Kenya. As we say goodbye to this African nation, we simply say “Asante” (thank you) in Swahili. Absolutely coming up with things to put in the cover shot is always a fun challenge, thanks for noticing!